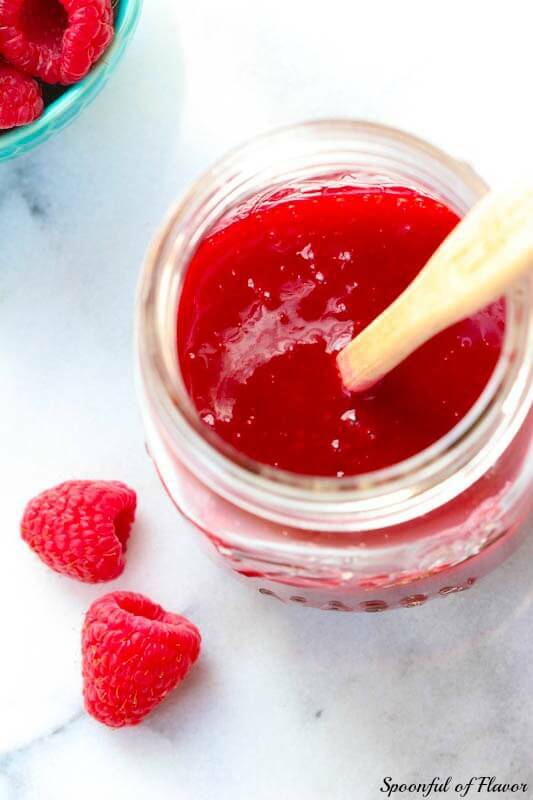 Raspberry sauce is quick, easy and the perfect addition to so many dishes. It looks so pretty drizzled over a slice of cheesecake or a scoop of vanilla ice cream. Every time I eat it, I start dreaming of a bright and sunny summer day. Most of us could use a little warm sunshine on this cold winter day. This recipe is the sauce that keeps on giving. Drizzle the sauce over yogurt, cheesecake, french toast or a scoop of vanilla ice cream. Since I’ve been on a yogurt kick lately, I drizzled a little in my parfait one morning. You could even drizzle it over some brownies or or a slice of chocolate cake. I confess, I drizzled this over a slice of chocolate cake and it was divine. Because, after all, who doesn’t love the combination of chocolate and raspberry. Heat all of the ingredients in a pan and strain through a fine mesh sieve to remove the seeds. 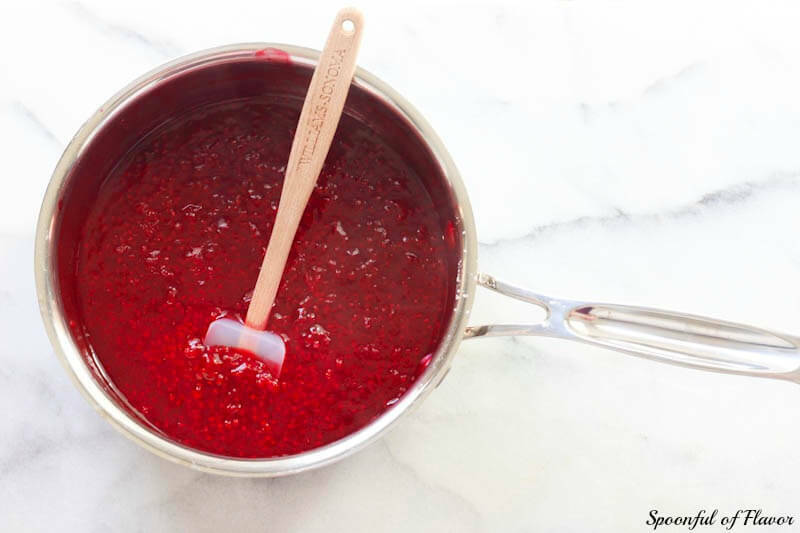 Within minutes, you are ready to add this beautiful sauce to your favorite dish. 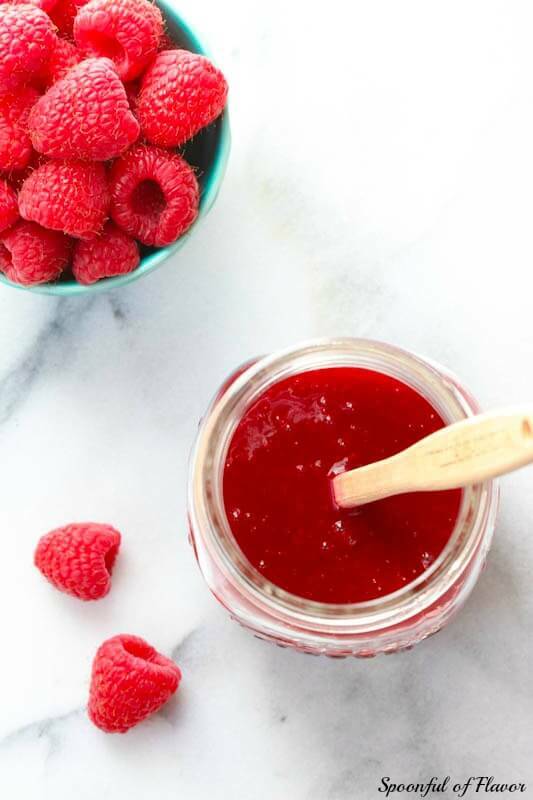 Drizzle this raspberry sauce on your favorite dishes and make them even better. 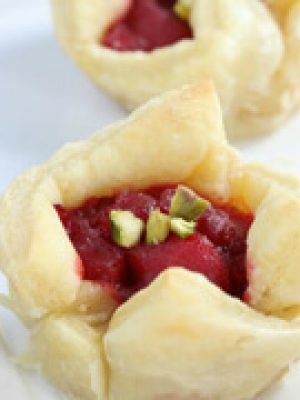 This recipe is quick, simple and fun to make. In a small saucepan, combine the cornstarch, sugar and water. 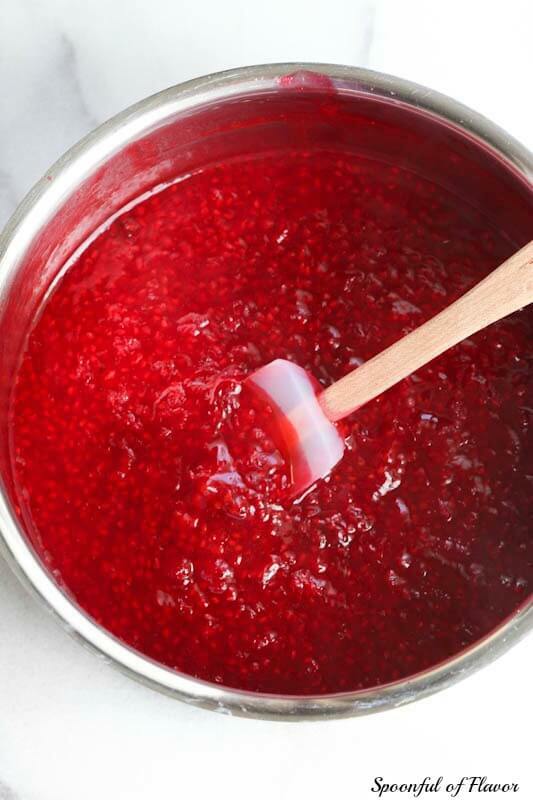 Add the raspberries and cook over medium heat. Stir constantly until the mixture boils. Once boiling, cook and stir for one additional minute. 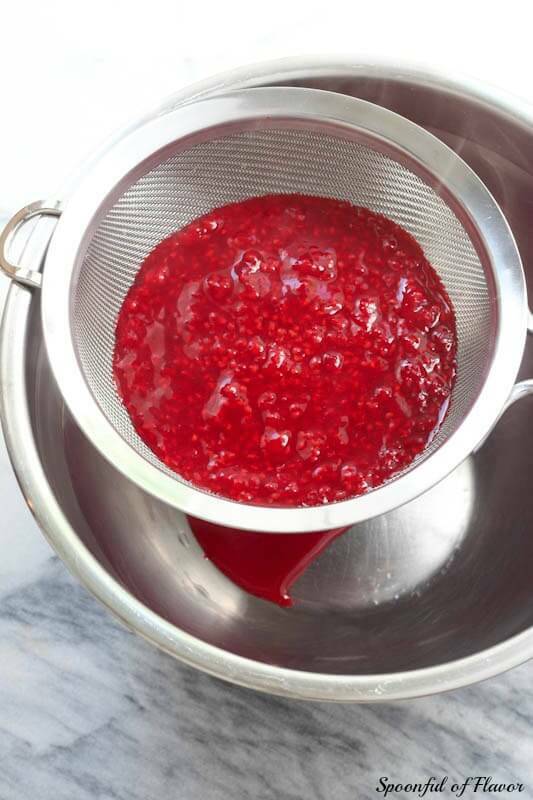 Strain the sauce through a fine mesh sieve placed over a bowl to remove seeds. The sauce can be served warm or cold. Store in the refrigerator. This is delicious!! I made this today for our Thanksgiving Cheesecake!! I made this today--very yummy! I am serving it over a white chocolate cheesecake. I'm a keener for fresh berries,so can I use fresh? Hi, Susan! Yes, you can use fresh berries for this recipe. Enjoy. I made a healthy-ish cheesecake earlier today and needed something tasty for garnish. 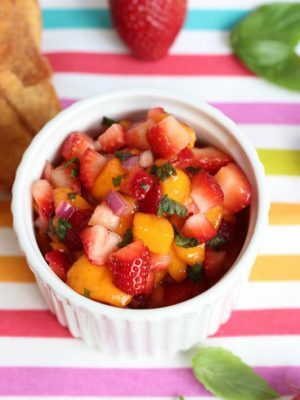 I thought I would give this sauce a try because I love how it has lower sugar than many fruit toppings and can be topped on many dishes. 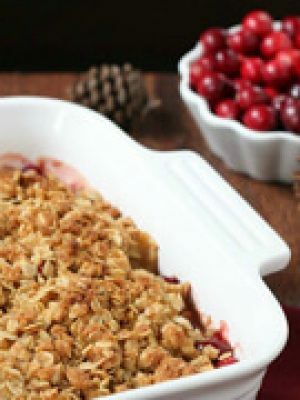 I just finished making it and let me tell you, I KNOW it will be delicious on my cheesecake tonight! Thanks for the recipe! Thank you so much for your sweet comment, Emma! I am so glad you loved it. Enjoy your cheesecake! Do you think I could add this to a buttercream frosting for cupcakes?? Hi, Michelle! I have never tried it myself but I don't see why you couldn't I would just add a little at a time while you are mixing the frosting. They mix on high speed to fully incorporate. Thank you! This sauce was delicious! I used it to make Lemon Mousse Raspberry Shooters. I am so glad to hear that you loved it, Tyress! Lemon Mousse Raspbery Shooters sound amazing! 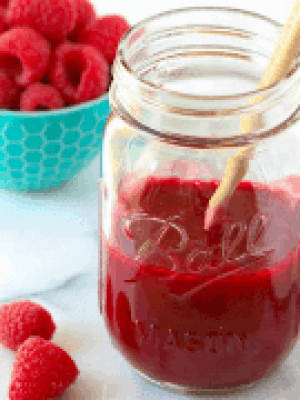 What would the equivalent be for fresh raspberries? I don't know how many cups are in 12 oz of frozen raspberries...I have many raspberry bushes and lots picked right now so I was looking for recipes and yours looks delicious. Hi, Julie! 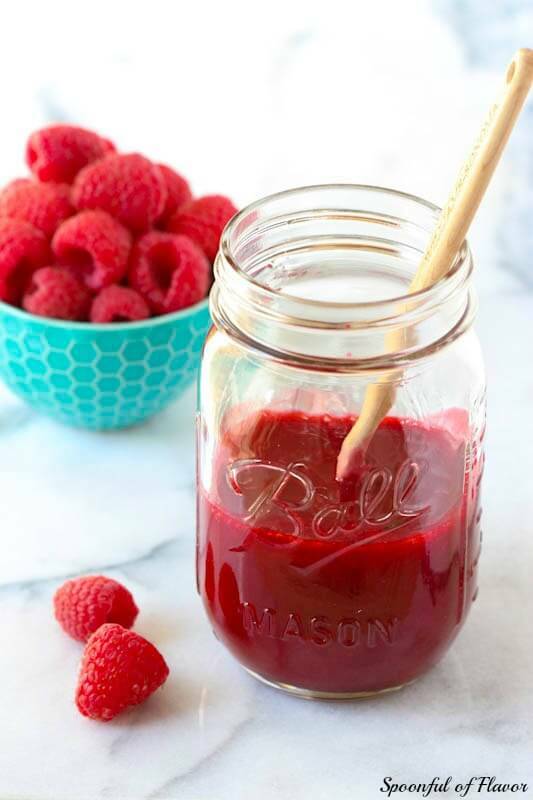 12 oz frozen berries is approximately equal to 3 cups fresh raspberries. I'm so jealous of all of your fresh berries! Enjoy! Thanks, Ashley. Brain must be tired today lol I know it can be frozen and sure I can make it with clear gel or no thickener for thinner sauce and can. I can a lot of stuff and give for gifts, and raspberries are very cheap right now. Just froze 12 6 oz containers. Hi Luci, I have never frozen or canned this sauce. I usually make it fresh and store it in the refrigerator for up to a week. Enjoy! Made this sauce exactly as the recipe said and it was very good. Came together in no time. Put it over pancakes. Delicious. The sauce was a bit tart and the pancakes were sweet so it was the perfect combo. Thanks for the recipe. Will definitely be making again. Hi Briana! I am so glad to hear that you loved the sauce! So delicious! I made this recipe x 4 in two different pots. In one I add white chocolate (about 12 oz. ), and just little bit lavender. Both versions are extremely good! I already promised to bring it tomorrow to my friend. She is buying cheesecake right now :) Thank you for the wonderful and easy recipe! Hi Marijka! I just noticed that I never responded to your comment. I am so glad that you loved the sauce. The addition of the white chocolate and lavender sounds incredible! This looks awesome, how long does it keep in the fridge? Hi Sandra, it will last for up to a week in the fridge. Looks delicious. I love that we can use frozen raspberries so we can get them anytime, maybe even use blackberries too. If I wanted to do a sugar-free version, do you think I could use stevia in place of sugar? I've never tried stevia in this recipe, but I think it would work. Yum! Looks so fresh! I would love some drizzled on some Greek yogurt! Thanks, Stacy! And thanks so much for following! This looks amazing on a cold, blustery day in the middle of a Minnesota snow storm! And so easy. Love it Ashley! Yum! 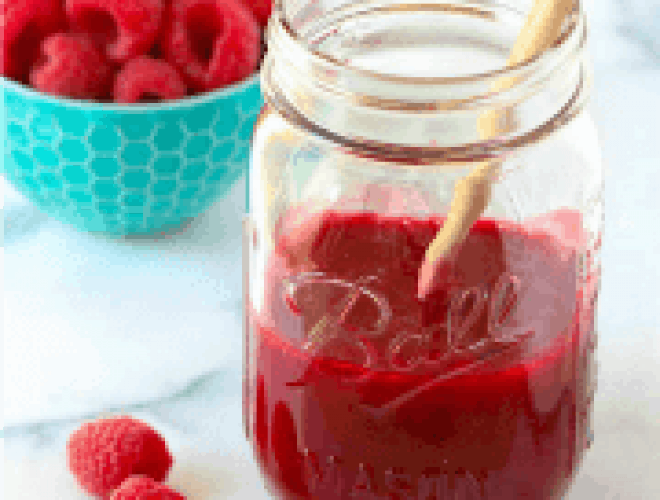 I'm a fan of anything with raspberries and this looks easy, quick and delicious! It is really easy, Robyn! I hope that you get a chance to try it! Thanks, Cathy! I always love linking up at your party!